Do you need to ship boxes to another city? Think about it: you can pack a few boxes of stuff, ship them in the mail, then fly to your new home with just a suitcase or two. As perfect as it sounds, shipping moving boxes is not that easy. First, it can be prohibitively expensive. Second, sometimes mail services won’t ship certain boxes or items. Nevertheless, it can be done. There are a number of options for shipping boxes. None of them are both cheap and convenient, but if you research them all, you should be able to determine which is best for you. USPS – The US Postal Service will ship boxes for you, and they can do it fairly cheaply and efficiently. However, they limit the type of items and boxes you can ship in the mail. For example, no single box can exceed 70 pounds or contain alcohol. UPS/Fed Ex – Private delivery companies can ship your stuff. However, the more weighty it is, the more you can expect to pay, and it gets real expensive real quick. If you need to ship over 500 pounds of stuff, then you can expect to pay well over $3,000. Moving Pods – Moving pods, also known as You-Pack, are storage containers that you pack and a truck drives and drops off at your new place. A cheap pod is probably the best way to ship boxes; however, they, too, can be quite pricey, costing over $2,000. Do some research to find the cheapest you-pack service. Flat Rate Moving Companies – A moving company might agree to a low flat rate if you can convince them that they’d only have to drive a few boxes for you. It’s worth a shot, especially for local shipping (same state). LTL Shipping – LTL means less-than-truckload. 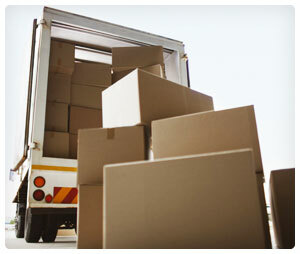 It is a shipping term used in freight carriage that means you pay for a portion of truck space, not the whole truck. Though not popular, this might be an option if you are willing to do the packing and loading yourself. Trains – Trains, like Amtrak, offer shipping services, often for very low rates. The problem is they can only deliver to stations on the rail line.